It's spring in Chicago, which means wet things no longer freeze outside and the sun actually shines. So I tried another project with Inkodye, the photosensitive dye tested in a few projects last year. I'd received samples from the manufacturer to play with, and I've been curious about using paper doilies as stencils. I taped a piece of white cotton canvas to cardboard wrapped in plastic. With a sponge brush, I applied red-orange dye. (Fabric really soaks this stuff up, so this required over half a bottle.) Update: I've learned that using a 1:1 ratio of dye to water works just as well! Next I arranged paper doilies on top. As I suspected, the doilies started to curl when they absorbed a little moisture from the wet dye, so I quickly poked some straight pins into them to hold down the edges. Then I placed the board in direct sunlight on our back landing and hoped our neighbors wouldn't step on it as they came down the stairs. Ten minutes later, I removed the doiles and scrubbed the fabric in soapy water. 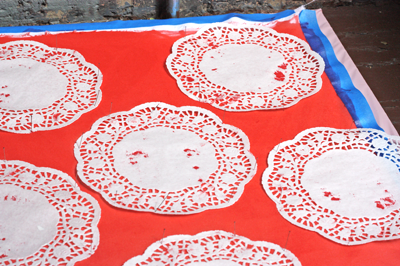 The white blotches are where the dye soaked into the doilies and they stuck to the fabric. A little bit unfortunate. On the other hand, I suppose you could argue this looks like some sort of faded, distressed antique — a tea towel discovered in a French flea market, maybe. And since my decorating style is supposedly "Country French," along with 89% of you, we should appreciate this, right? I give it a B-. But it was fun. Well, tell her thanks. Maybe her decorating style is Country French, too. Do five-year-olds have decorating styles? i actually LOVE this, splotches and all! Oh, YES! And it's quite unique! Not sure about the Country French part. Courtney is probably Kindergarten Chic. Anonymous, maybe you're Country French! :) Or, this may be an example of the phenomenon where everything looks and tastes better if you don't make it yourself. I love it! I can see how you wanted it to be a solid color where the doilies were but I think I like it better with the white splotches. I wonder how knit doilies would have faired. Good Lord do I love your blog!! Thanks for all the pretty pics and DIYs! Disposable plastic doilies might take care of the problem of the dye soaking through. Or you could use vinyl tablecloth yardage with doily cut-out sections. What an awesome idea! I have never tried this technique. I need to put this one on my to do list. 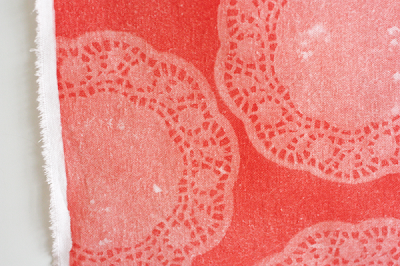 These doily patterns are great for fabrics to be used as cover in scrapbooking albums too! Sometimes the DIY project will show what you never thought. and it'll give us a surprise! I really like it! And it looks great on the chair. I wonder if coating the doilies with something (glue?) might help for next time. I quite like them as they are though. This is very pretty, and your right, it looks a bit antique. Wow! Very creative post indeed. Thanks a lot for sharing this post. ooooh love it, I was looking for that since a long time. I love doilies. Thank you! love the post and the creative possibilities that the product offers. thanks so much for sharing! 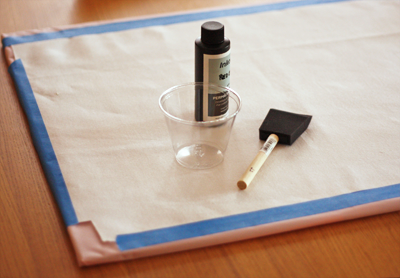 "Collect the excess Inkodye on your canvas by wiping it with a paper towel. 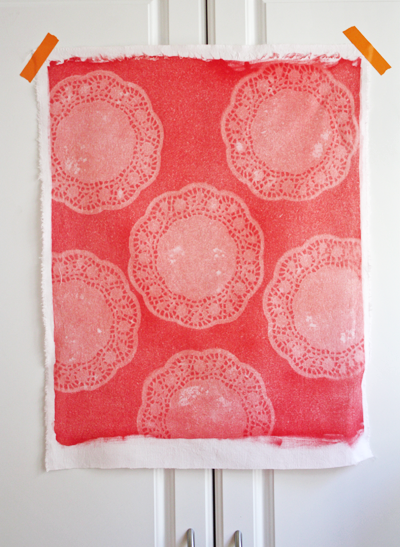 This step is necessary because you'll be covering the canvas with glass and excess dye can turn into condensation that can make your print spotty. You just want your piece to be a little damp to the touch, so don't be afraid to really wipe hard." I just have bought it to try! I love it!!! It´s lovely! My tip is to place a glass sheet on top. It holds the pattern in place and allows the sun to develop the ink. I´ve tried and it works, BUT it can make the ink stick to the glass and give you a bit of "marble" effect. Thanks for this post on a doily print fabric. I think the chair looks wonderful with this "country French" look. This is beautiful, i love the dainty effect it leaves..very pretty!! I love it-the flaws make it clear that it is hand made. Absolutely beautiful and the choice of color is brilliant. So impressed. I really like this. 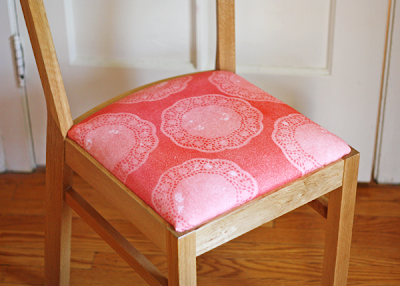 I also really admire you for not only making your own fabric but then upholstering it on a chair! I can barely find time to sew anything but of course that's probably because I'm scared to fail, so I just procrastinate and then I never start anything. Hmmpph. Ha! :) You must be referencing yesterday's desktop wallpaper. And once you've stapled fabric onto one chair bottom, future chair bottoms will take you five minutes. No sewing required. This project has so many possibilities. What dye did you use? love this! i'm curious about two things: first, how permanent is the dye? can you wash it if you use in on clothing? second, do you know how light-fast is it? as in if you place that chair in the sunlight, does it fade? thank you! Yep, you can wash it. 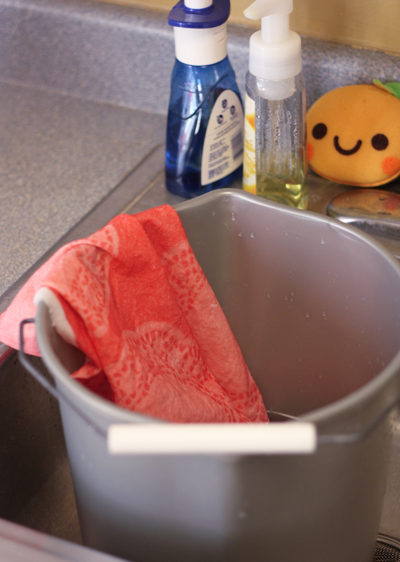 I washed a project in the washing machine before, and it faded maybe a tiny bit but not badly. As for lightfastness, not sure. I haven't left anything in the sun for days or weeks. I have done a lot of work with Cyanotype (a similar dying technique using chemicals), I reccommend printing black silhouettes onto acetate and using these; they give a very defined print and open up lots of possibilities for images. Sounds great! How are you printing on acetate--inkjet or laser? a B- ???? Really? Oh I find this stunning! Any thoughts or insight as far as color fastness??? I was thinking this would make amazing fabric to try and stich up dresses for my granddaughters, ages 10 months and 13 month. Thanks for sharing your play/work! I'm really interested and inspired and I'm wondering: what kind of soap do you use when washing the fabric? I used regular laundry detergent. Tried out Inkodye for the first time after seeing your projects! Thanks so much for sharing, Jessica! Yay! Good luck with all your experiments!